I am not a morning person, never have been. My mom used to wake me up for school when I was younger, and I'd sit up in bed, say something to her, and then promptly fall back asleep after she left. In college, I perfected the art of getting ready in 15 minutes or less, and would snooze until the last possible second. Once I started my professional career, I had to leave slightly more time to get ready in the morning since hoodies and baseball hats were no longer an option. But I still had my routine down to the minute. If I misplaced my keys or had any unexpected delays, I was screwed. This also meant I had zero time for food prep at home. Eating breakfast, lunch, and dinner at my desk in my early 20's was like a rite of passage. This sense of pride however started to fade (rather quickly) over the years after I repeatedly failed at adapting a healthier lifestyle (making lunch at home being a key point of failure). I realized that my hectic schedule wasn’t cool at all. It was actually incredibility annoying and frustrating, and kept getting in the way of broader health goals. Once I dove into the health and fitness arena full time, I assumed that healthy eating would be an automatic side bonus. But as my personal training scheduled filled up, it actually became harder than my finance days to stay consistent, because my schedule was now different and somewhat unpredictable every day. This is when I realized that I needed to simplify. Now I make lunch consistently throughout the week and it only requires a little bit of prep on Sunday, and 5-10 minutes of prep each day. You will have to determine which exact foods you enjoy most, but these guidelines will help you build lunch quickly. My favorites are brown rice, brown rice pasta, or sweet potato cubes. 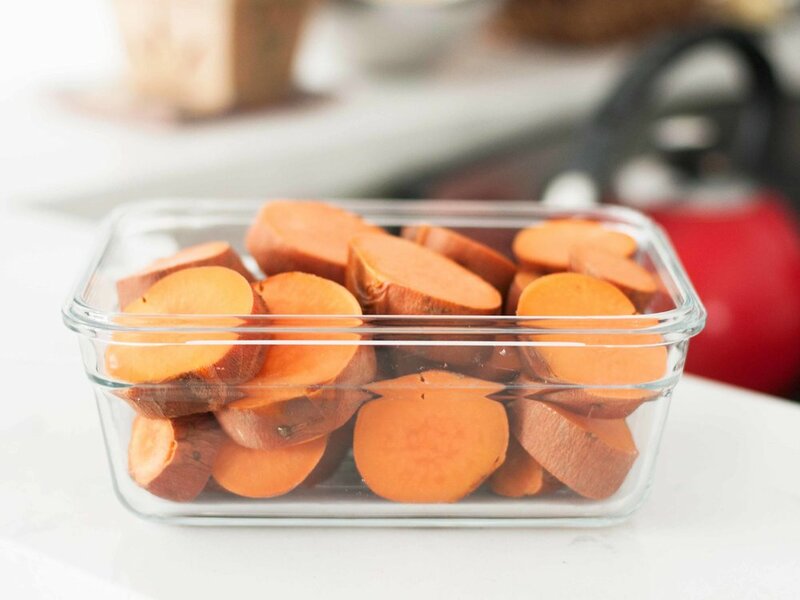 Keep them stored in a glass container in the fridge. My favorites are chicken or ground beef (prepped ahead), or chicken apple sausage from Whole Foods (zero prep required). My favorites are frozen broccoli or a roasted and peppers and onion mix from Trader Joes. Sauce in general saves the day, but I add salsa to almost everything because I'm from New Mexico, but pesto and marinara sauce are also great. The key to consistency is to keep it simple. Don't try and make something different every day of the week. I generally eat the same lunch 3x per week, and the other 2-3 days will vary slightly (with 1 or 2 lunches out). You can rotate each week, but keep it simple and PREP AHEAD. Your waistline and energy levels will thank you!